LONDON: BBC Worldwide Showcase is gearing up for its flagship event in Liverpool later this month, which will feature BAFTA-winning writer Jimmy McGovern on hand to present his new drama series Broken. 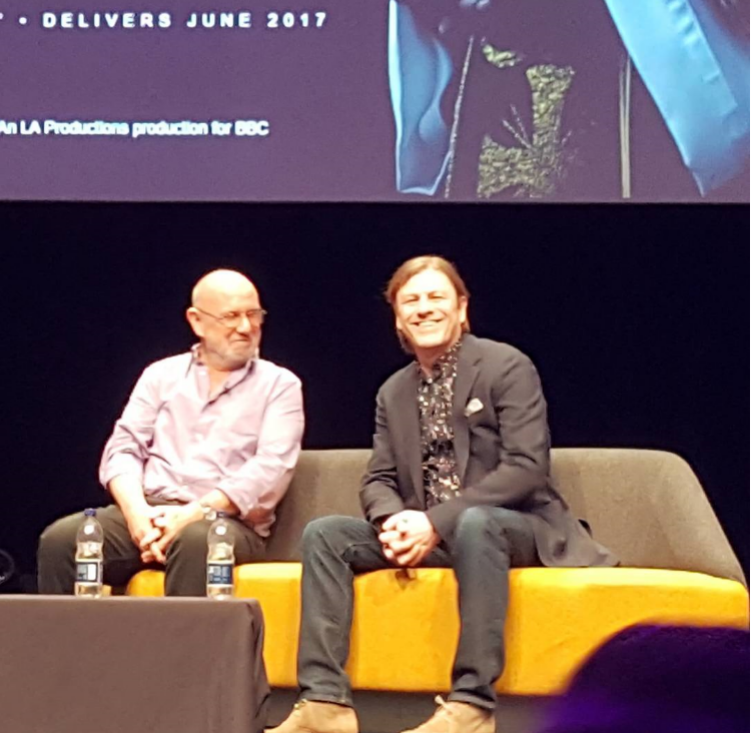 The 6×50-minute drama Broken comes from LA Productions for the BBC. 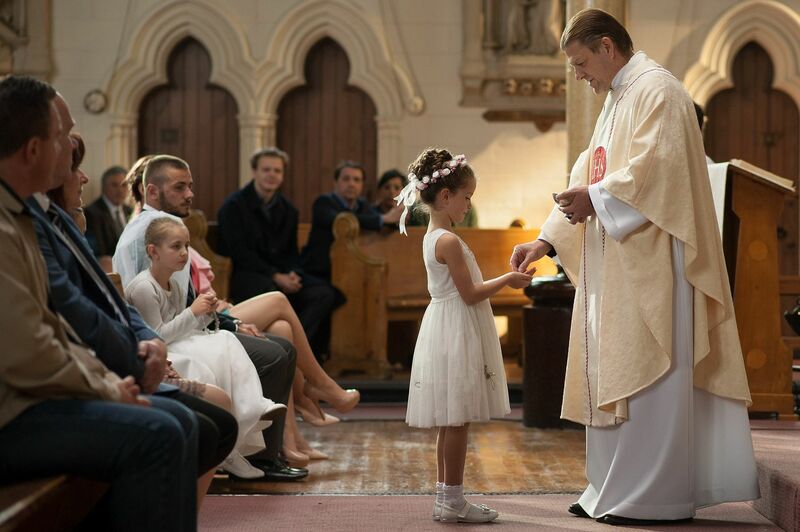 Sean Bean headlines the cast of the series, which is centered on Father Michael Kerrigan, a Catholic priest presiding over an urban parish in northern England. With a chequered past and a complicated relationship with his own family, the priest is determined to help his parishioners through their troubles. Joanna Lumley and Jennifer Saunders will host the event as a nod to the international success of Absolutely Fabulous, which has sold to 240 markets around the world. BBC Worldwide Showcase is set for February 19 to 22. The students of South Sefton College took the opportunity to be involved in the filming of a new Jimmy McGovern BBC TV drama ‘Broken’ featuring Sean Bean. 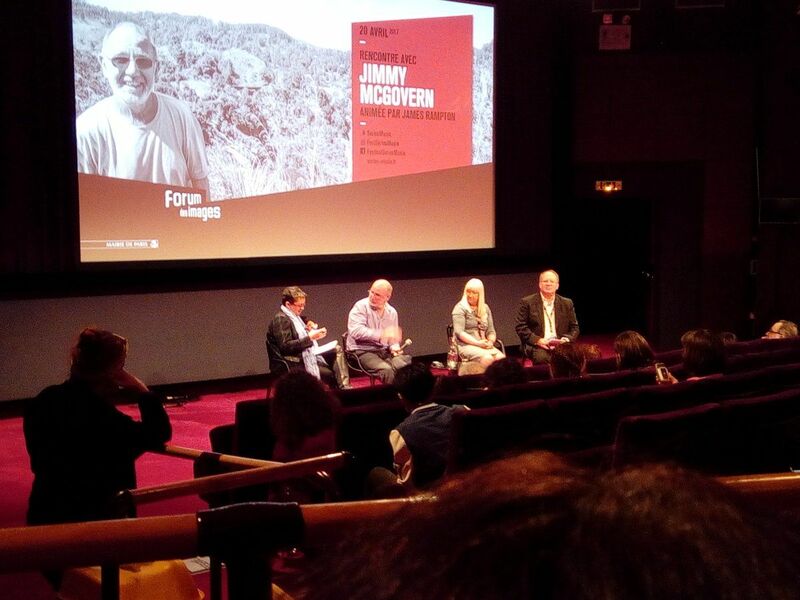 Principal Frank McCann, said: “Obviously this was valuable experience for our media, film, drama and performing arts students who got to see television production on both sides of the camera. “Many other students took part in the drama as volunteer supporting artists. Arriving at college for 7.30am, they were met by the assistant directors, costume and makeup artists and briefed on what would be expected of them before going on camera. Thank you Patch for posting this !!! Hill swapped the BBC for ITV last year, and is now head of drama at the UK commercial broadcaster, unveiling her first slate late last year. 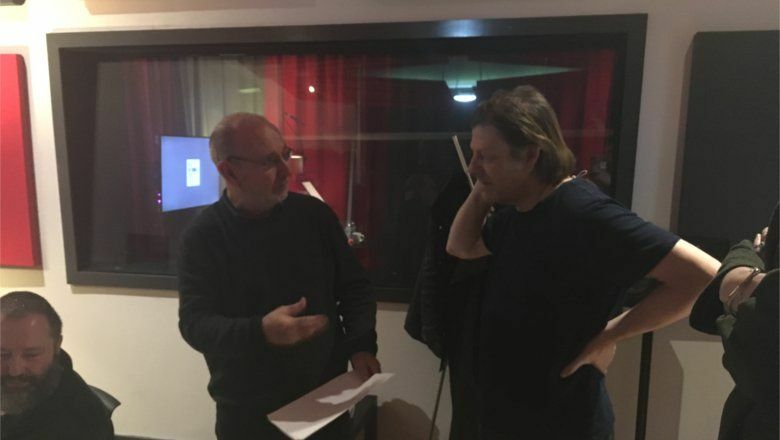 McGovern, whose credits include Cracker and Hillsborough for ITV and The Accused new Sean Bean BBC One series Broken for the BBC, is one of the best-known writers in the UK and an outspoken voice in the industry. He told TBI that Hill’s move ITV was an important moment for the UK drama business. In terms of regional production McGovern’s latest series – Broken – is set in the north west of England. 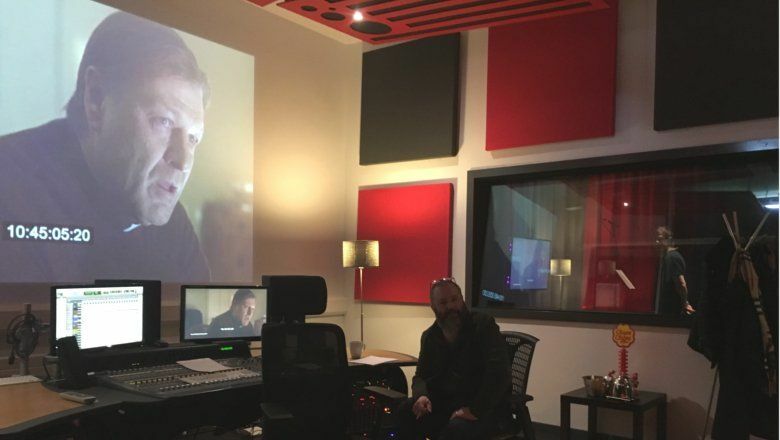 The series stars Sean Bean as a Catholic priest and was shot in McGovern’s native Liverpool with some of the work on the gritty drama is being done in the deprived Kirkdale district, an area the writer is keen to support. He said that shooting locally gives shows integrity, and that production in the north of England needs to be less focused on Manchester and the BBC’s Media City. 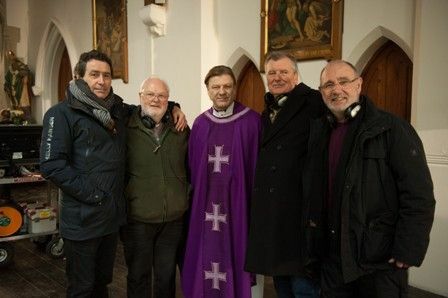 A British Jesuit commissioned to help one of television's tough guys to portray a sensitive, vulnerable north country Catholic priest says the experience was "very satisfying", with the production team keen to be authentic and showing immense trust. 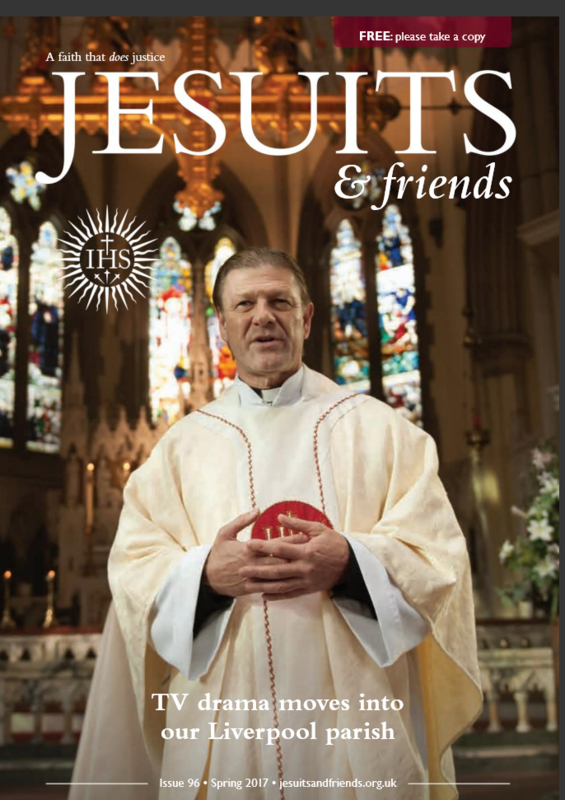 His account of the experience is the cover feature in the spring edition of Jesuits and Friends, which is now available from Jesuit parishes, schools, chaplaincies and spirituality centres throughout Britain. It is also available to download. 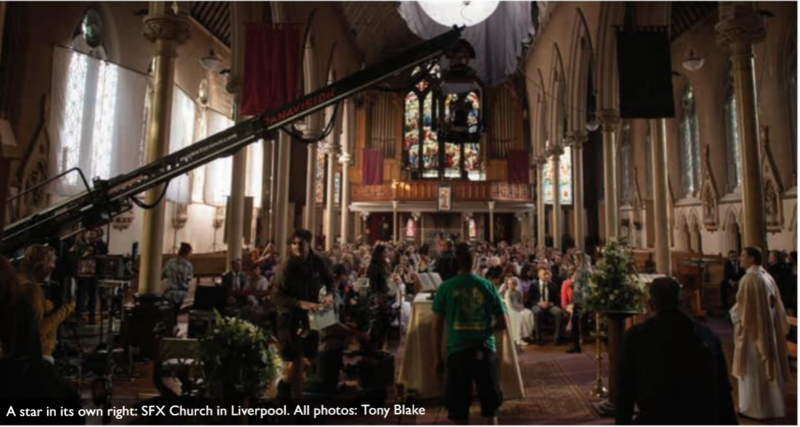 The venue selected as the fictional parish of St Nick's for the BBC drama to be shown this spring was Liverpool's St Francis Xavier's (SFX); and parish priest, Fr Denis Blackledge SJ was asked to mentor actor Sean Bean in his role as Fr Michael. Broken was written by the well-known Liverpool writer and alumnus of SFX College, Jimmy McGovern, and was produced by LA Productions. Sean Bean is best known for his roles in Sharpe, Lord of the Rings and, most recently, Game of Thrones. They wanted to know what it was like to be a Catholic priest working in an urban environment in the early 21st century," explains Fr Denis. "It starts in the guts, I told them; then it goes through the heart of a man who knows his own strengths and weaknesses, vulnerabilities and personal history. Eventually, it comes out in a compassionate understanding approach, with open eyes, listening ear and heart, taking individuals as they come, no matter what the situation." Fr Denis says he was greatly impressed by how the directors were meticulous in their preparation and were determined to make Fr Michael's personality and humanity come over with total authenticity. And Sean Bean himself attended Mass at SFX himself beforehand to understand fully how the Eucharist should be celebrated. 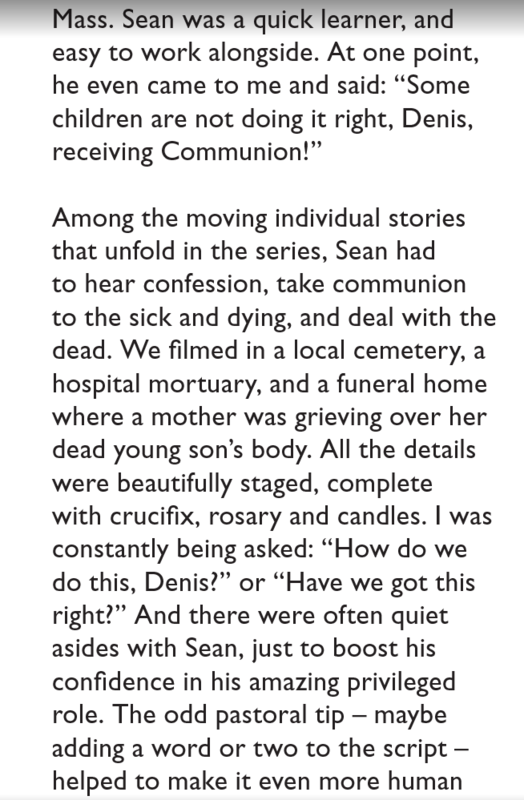 "It was very satisfying to see how Sean grew into the part," says Fr Denis, "and how seriously he took his role to be a man gifted with priesthood." At the heart of the priesthood – and key to the entire series of Broken – is the Eucharist, which gives the drama its title at several levels. "Only by accepting his own brokenness can any priest truly live a Eucharistic life," according to Fr Denis, "and echo Jesus in his compassionate approach to those whose lives he is privileged to reach out to. This comes across strongly in this TV series." 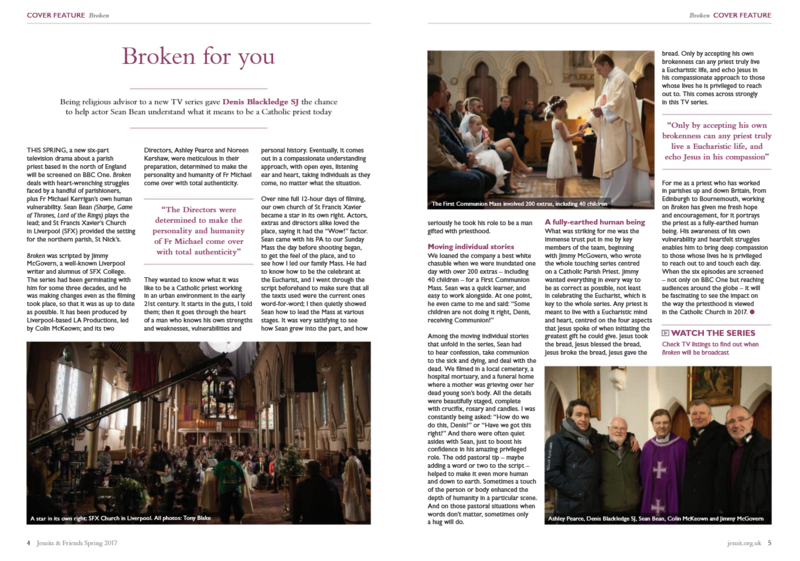 Broken is due to be screened by BBC One (with a potential global audience) some time after Easter, and Fr Denis – writing in the spring edition of Jesuits and Friends – says that it has given him hope and encouragement, as a priest who has himself worked in parishes up and down Britain. "When the six episodes are screened … it will be fascinating to see the impact on the way the priesthood is viewed in the Catholic Church in 2017," he writes. Thank you Patch for posting this story about SEAN AND BROKEN !! The article was WONDERFUL and the pictures are BEAUTIFUL !!! 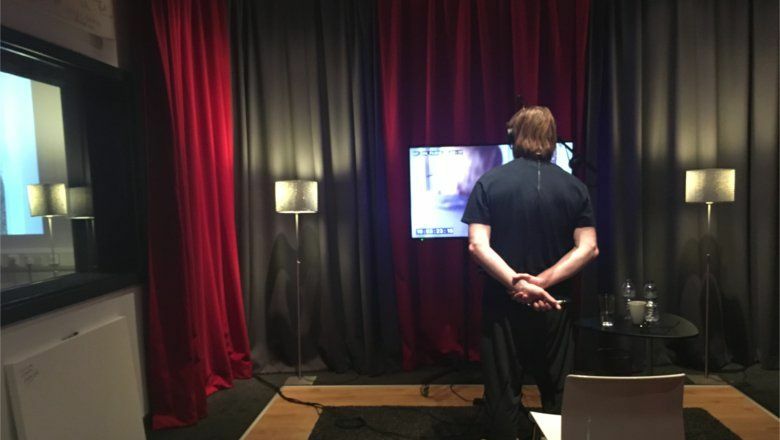 Great to have the guys from @LAProductionsUK recording #ADR with Sean Bean for new #BBC series #BROKEN yesterday. Love the longish hair. Hope he keeps it for TFC. Looking at the pictures from Belfast,he does. This looks like a good show. I hope it airs in Canada or some kind person posts it on here! Meh, I am not a fan of it...I like it when it is shorter, like in The Young Messiah. :-) But hey, will take whatever I can get! joeldevlindp@laurenlyle7 well I'm grading 'Broken' in between filming in this and so am begrudgingly realising you're actually quite good!! It's all looking amazing, due out tail end of May. Sean Bean (“Game of Thrones”) and Anna Friel (“Marcella”) head the cast of this BBC One primetime drama, but the show really belongs to famed co-writer Jimmy McGovern (“Cracker,” “Accused” ), on of the most redolent voices in U.K. drama. Here , Bean plays Father Michael Kerrigan, a Catholic priest struggling with his own past and the problems of his parishioners’, whose broken lives he can’t always mend. Shot on location in McGovern’s native Liverpool, expect a gritty drama whose outcomes deliver social comment on the state of the working class in contemporary Britain. Sales: BBC Worldwide. A selection of 10 series that will enjoy their international- or world-premiere screenings at Series Mania, either just before or just after they bow in their home territory, judged by a prestigious International Jury. ◦Best Actor in an International Series. Father Michael is a non-conformist and independent priest with a parish in the north of England. He is confidant, psychiatrist, and confessor to his flock, who are struggling to reconcile their beliefs with the challenges of their everyday lives. This new creation from Jimmy McGovern (Accused) is a touching, realistic social portrait of modern England. Nouvelle perle à #SeriesMania : 2 premiers épisodes de #Broken. La claque de l'année ! 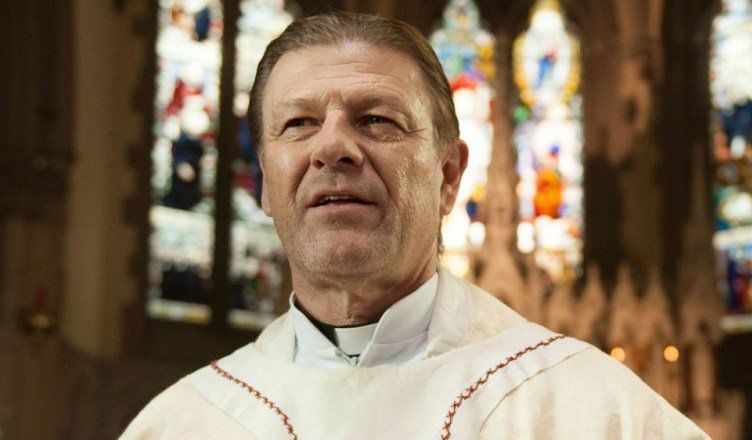 Merci à #SeanBean et #JimmyMcGovern pour leur talent. Anna Friel, for her role in the British series Broken, created by Jimmy McGovern, Shaun Duggan, Colette Kane and Nick Laether. 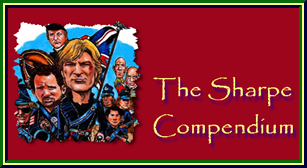 Codirected by Ashley Pearce and Noreen Kershaw. Produced by Jimmy McGovern, Donna Molloy, Colin McKeown and Sean Bean. Broadcast in the UK by BBC One. The jury said that Anna Friel breathes life into her character with stunning honesty […]. She is heartbreaking and stunning performance leaves no question as to why this show is called “BROKEN. PARIS — Ed Stark he is not. 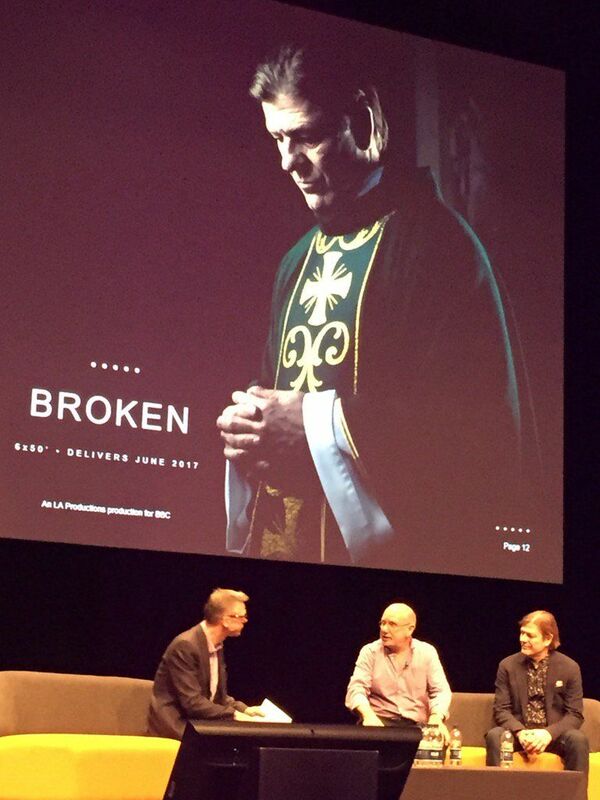 In BBC1’s upcoming primetime drama “Broken,” Sean Bean plays Father Michael, a Catholic priest in North-West England, struggling with his inner demons, seeking atonement for his sins of youth, shy, retiring, nervously playing with his hands when confronted with a problem. Of an evening, he goes down the bingo, listens to the BBC shipping forecast about Dover, White and Sole, or sings “Chattanooga Choo Choo” to his bedridden, dying mother. In its first two episodes, world premiered at Series Mania in its main competition, Bean is only once seen as a man of action, running down the street, because he’s late for a parish meeting. His immediate reaction to his parishioners’ problems – and they are legion: Unemployment, and uncaring welfare state and police malpractice, just to mention three in Ep.1 and Ep. 2. – is to scratch his temple and play nervously with his hands. 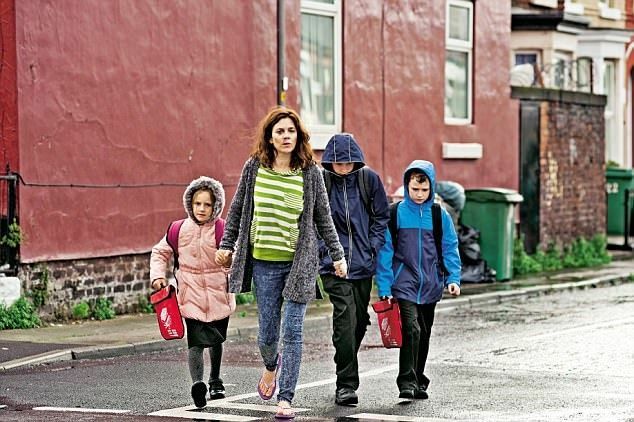 In Episode 2, where Anna Friel plays a single mother of three driven to desperate acts when she loses her job after a barney with her manager and can’t afford to pay for her young daughter’s first communion dress, Father Michael does nothing to help her. 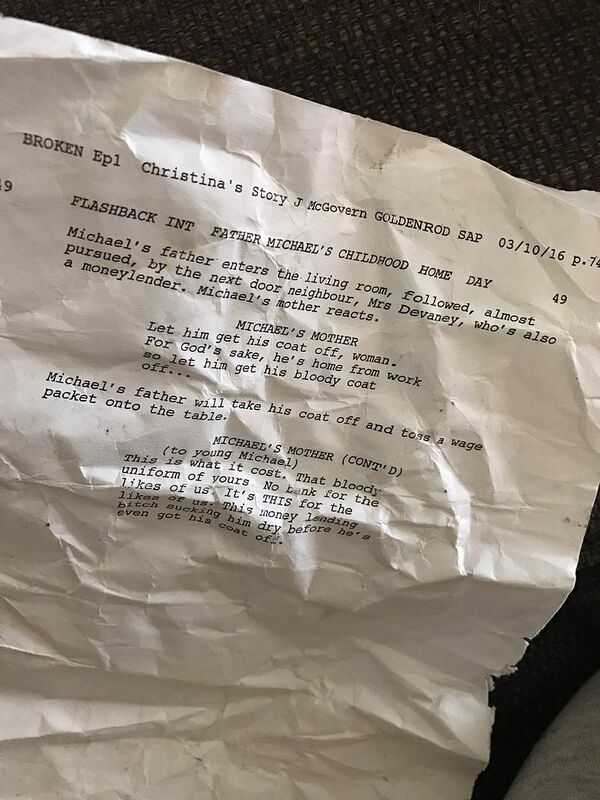 In the second segment, the mother of a boy who’s suffered a psychotic attack phones him at night to ask him to come round: Father Michael is the only person her son listens to. But Father Michael’s so knackered, that he’s gone to bed and doesn’t pick up the phone. But Father Michael’s so knackered, that he’s gone to bed and doesn’t pick up the phone. “It’s extremely Christ-like, to have all your hopes and strategies demolished, to perceive yourself as a failure, and then realize: ‘No, you’re not,’” McGovern said. Television viewers will be familiar with her as the mercenary Bella Wilfer in Charles Dickens’ Our Mutual Friend and the violent, unpredictable detective in the recent, critically acclaimed ITV drama Marcella. Next month she is back on our screens in Jimmy McGovern’s new six-part BBC series Broken.